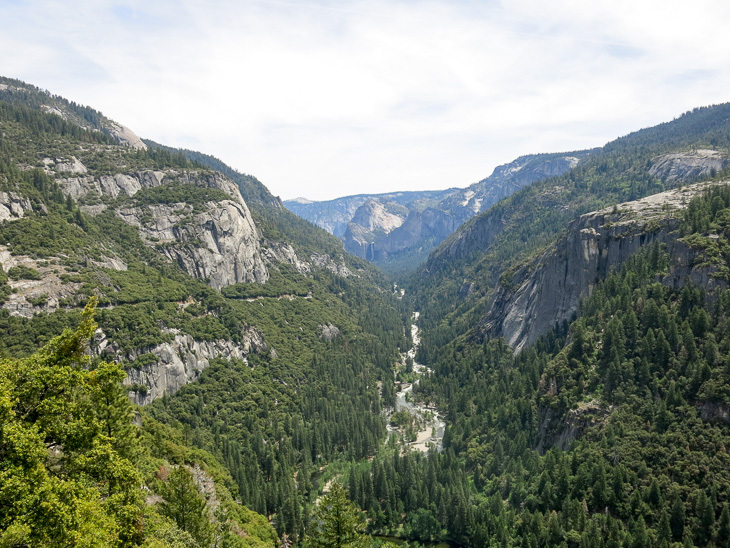 After our first couple of days exploring the Golden State (see previous post) it was time to head inland, to Yosemite NP – one of the oldest ánd coolest national parks in the US of A. 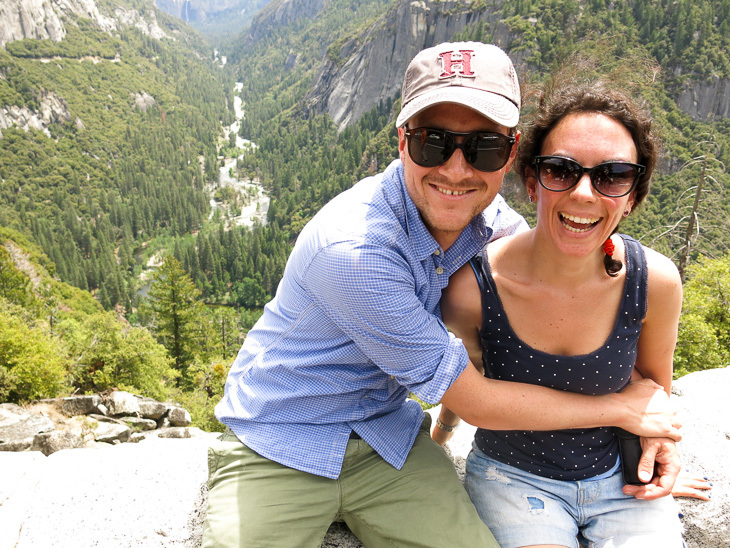 Most visitors to the park come from San Francisco or LA and drive straight up to Yosemite, but we decided to make an extra stop to get in touch with a bygone era. 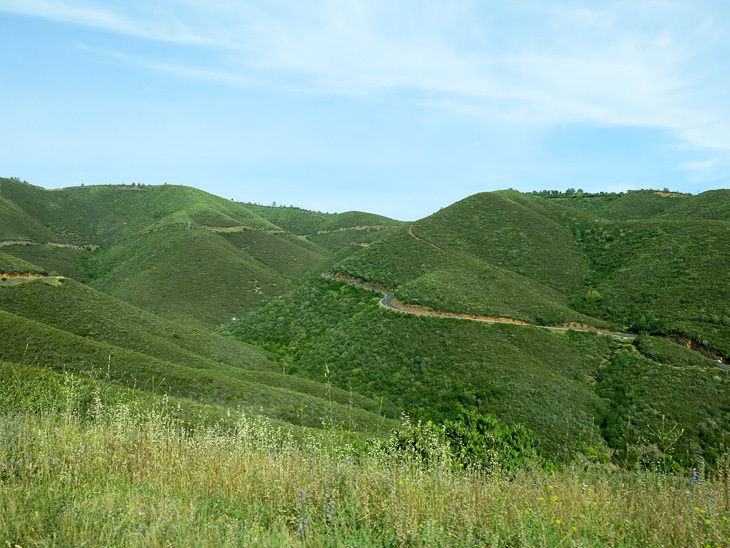 Gold Country is a region in central Northern California and is known for its many gold mines that were responsible for the Gold Rush in the mid-19th century. 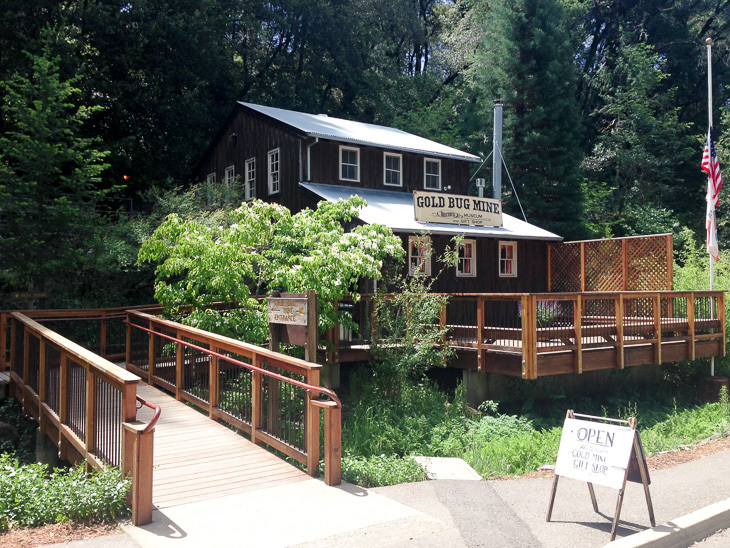 In 1848 James Marshall, the superintendent on the construction of a sawmill for Captain Sutter, found a small piece of shimmering gold blocking the waterwheel, which marked the beginning of the Gold Rush. 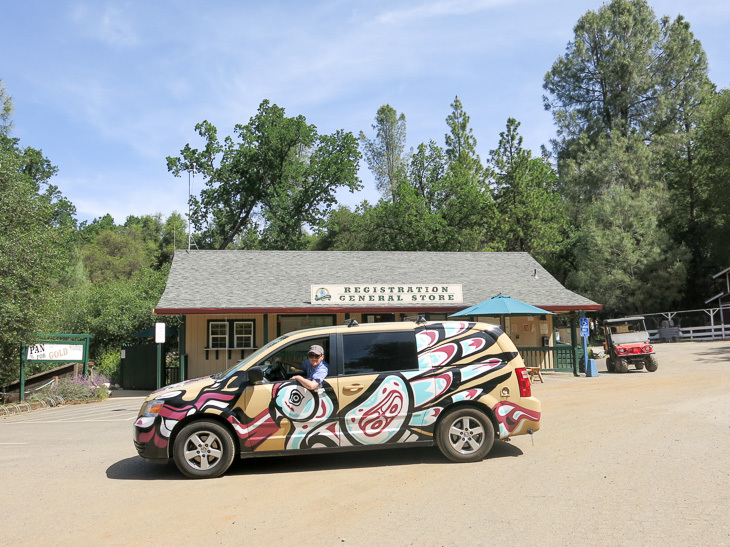 Today the small towns alongside Gold Country’s arterial road – Hwy 49 – seem as sleepy as they probably were before 1848, but it’s quite worth it to spent a few days in the region and soak up that historic vibe. 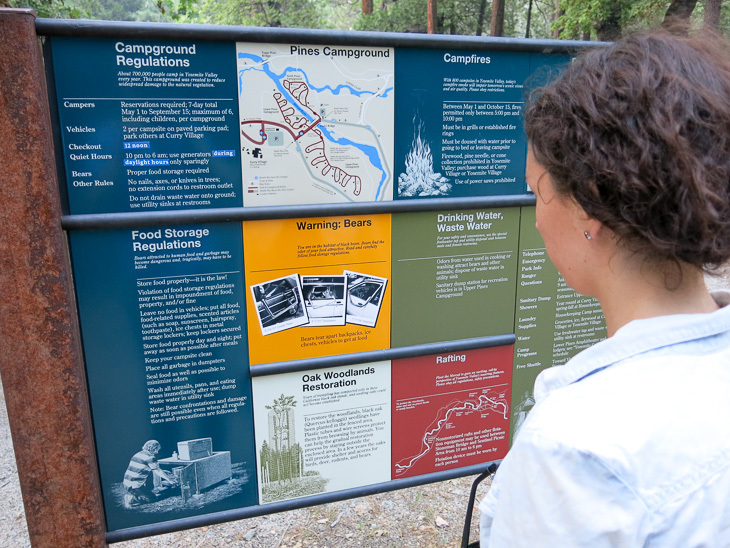 We visited the Gold Bug Park & Mine in Placerville (aka Hangtown) which I truly recommend. 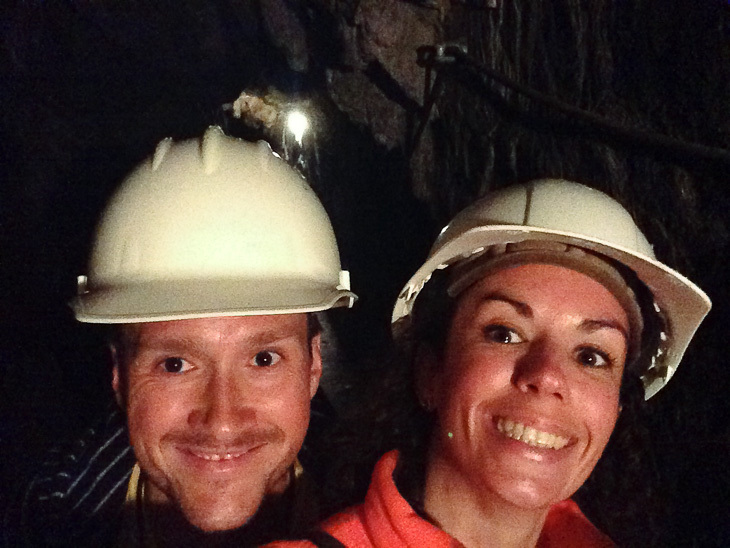 It will only cost you a few bucks and you get to listen to an awesome audio tour while wearing a fabulous hard hat and checking out the mine on your own. The staff are all retirees who look like they just stepped off the set from Golden Girls and are extremely friendly ánd they will tell you about that time an angry gold-seeker almost fired his rifle at them in order to claim his spot by the river. Fun times. 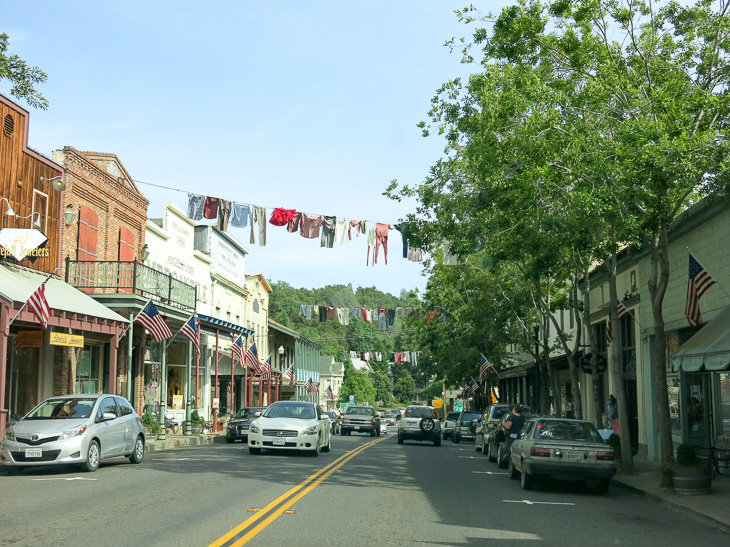 Unfortunately, we didn’t find any gold shimmerings… Hangtown itself is also worth a short visit, it gave off a strong Twin Peaks vibe with those quirky shops (the oldest hardware store west of the Mississippi – oh yes) and equally quirky people. I truly have a thing for small town America. Love it. 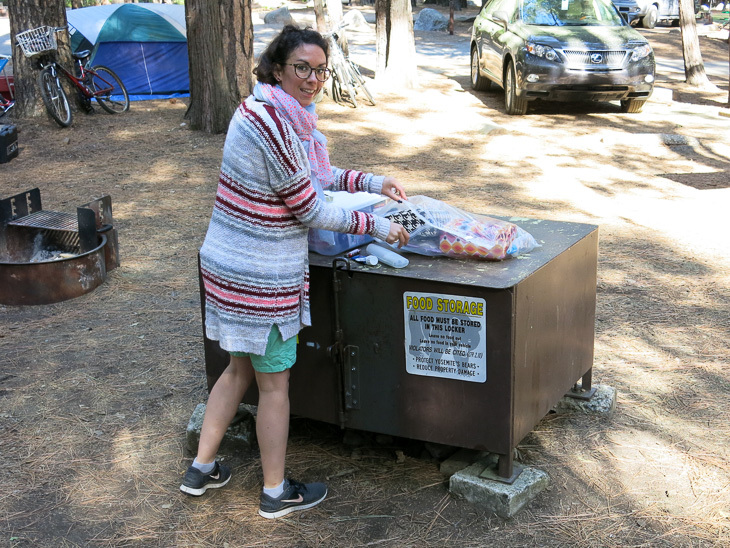 You probably remember how hard it is to get a Yosemite camping spot – that is, within the actual park (see this post). On the 15th of each month at 7am pacific time the reservations for the entire month 4 months later will open up, and the camping spots are gone within a few minutes. Minutes! So on January 15 at 4pm (Amsterdam time) I was ready to go. And I came prepared: I had set up a profile at the reservations website weeks before, I had selected a specific campground ánd site, and I even synched my computer to NASA time and everything. So once the clock turned to eaxctly four o’clock, I immediately pressed my shaky index finger on the mouse, and… WTF?! I got it!!! Our exact dates! Yeehaa! 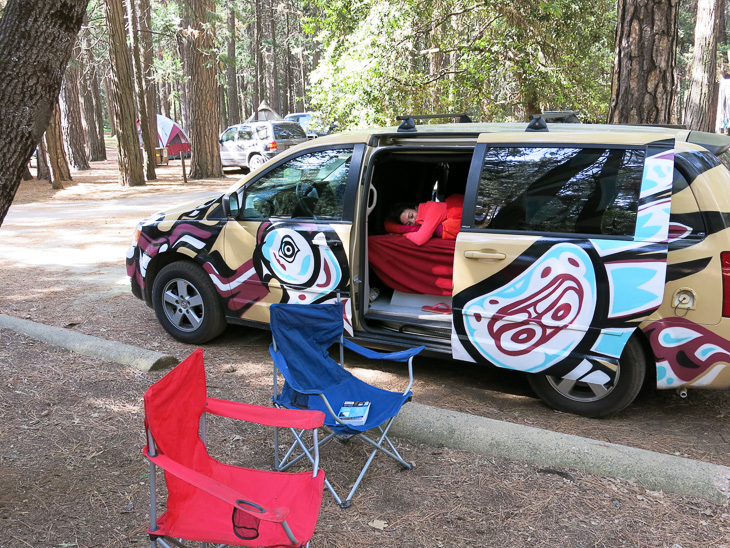 Never thought that much excitement would rush through my body after reserving a campsite. But hey, 2 minutes later, all sites for the entire month of May were booked. Nuff said. The night before we entered the park we camped at a nice campground in the small town of Groveland, near the park’s west entrance. 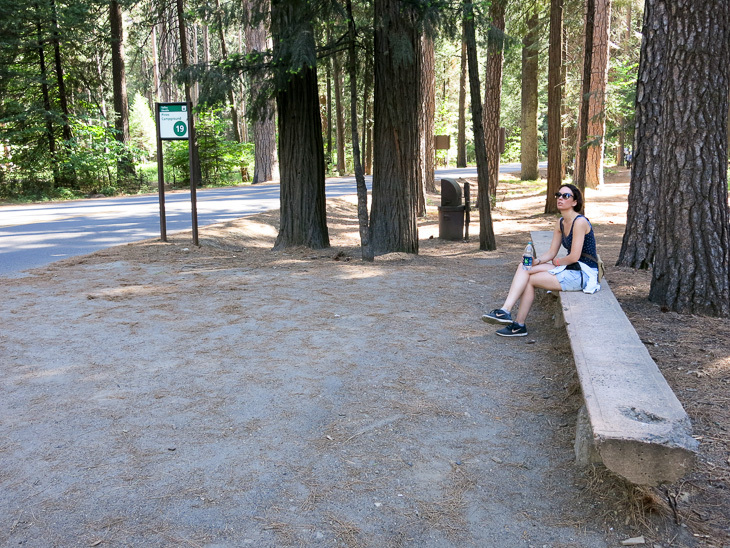 If you miss out on the camping spots within the park, Yosemite Pines RV Resort is a good place to set up camp. To make sure you get that wilderness vibe you can hear the wolves howl to the moon at night. As a bonus you get to flirt with another couple of Golden Girls working the register at this joint – lovely. When we finally made it to Upper Pines Campground we were welcomed by this friendly senior ranger who asked us if we had ever camped in bear habitat before. Uhm, well no, not really… “Okay then, folks! Welcome to bear country!”. 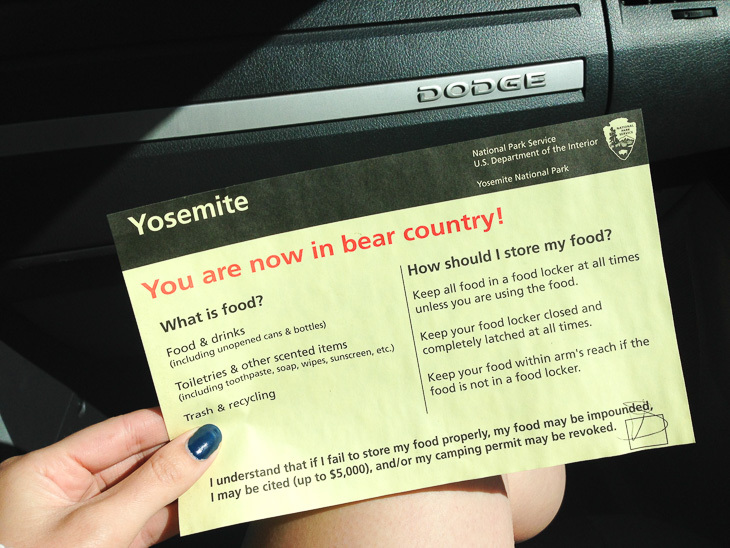 We’d read up on Yosemite quite a lot and the main thing we remembered was: bears can break into cars. That’s right. 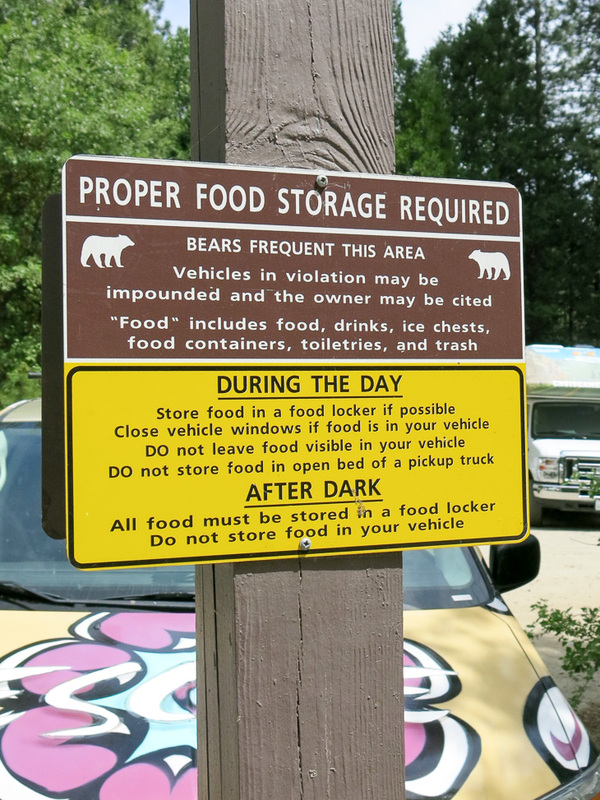 In order to keep the bears wild (and keep you alive) you must – as in, by law – keep all food and food-scented items in the bear locker at all times. This means that besides food, everything with a smell – shampoo, sun screen, candles etc – has to be put away. While cooking, the locker has to be closed as well (“think of it as a refrigerator”) and what you are planning to eat has to be within arm’s reach. 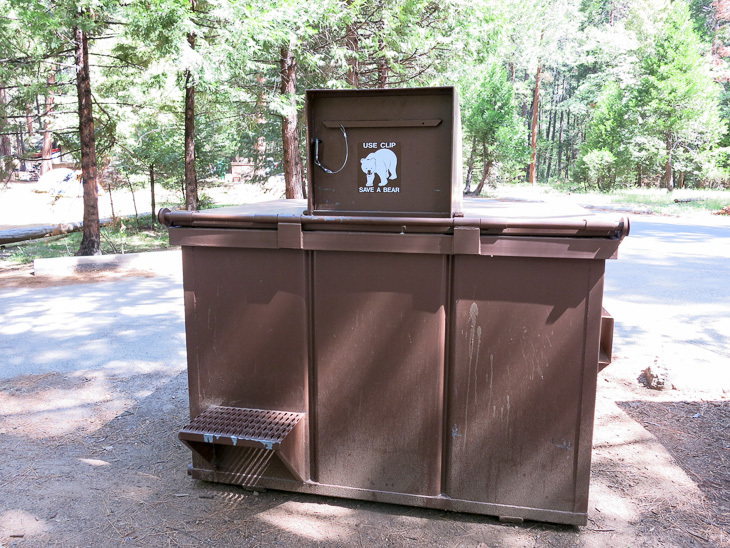 Bears do frequent the campgrounds and when you encounter one you have to do the following: stand up tall (well, that can be a problem for a tiny human like me), speak with a low and loud voice, and slam on pots and pans to scare it off. Mmmkay… Even though I was a bit anxious that first night (remember: bears can break into cars), after the first hike you kinda get used to the idea. 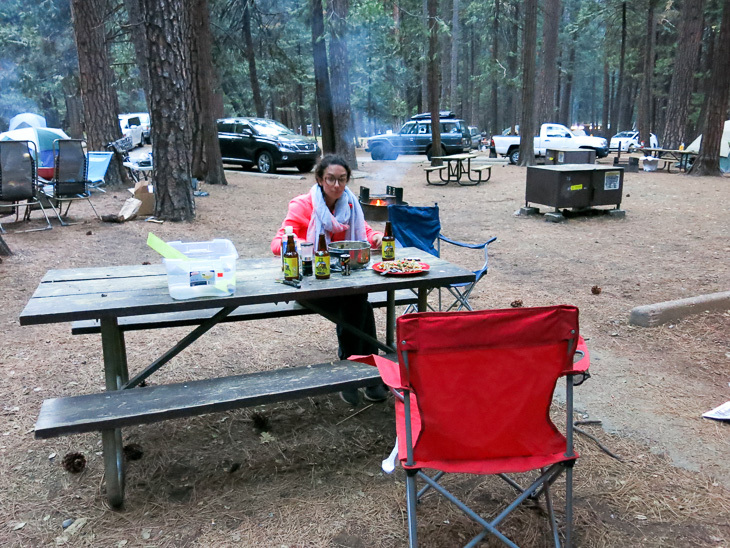 Camping within the park is so extremely awesome. At night everyone gathers around their fire pits with an outdoor meal and a cold beer for family time with fun and games. It is totally the most “All-American” experience I’ve had so far in the US. 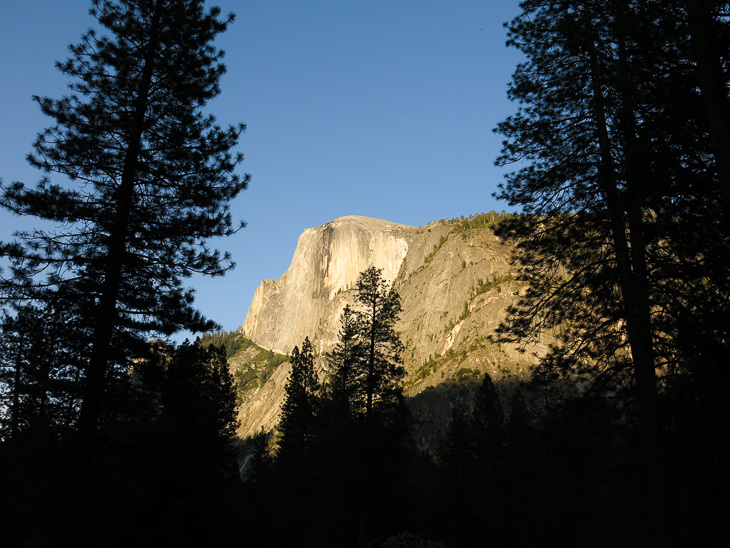 And no, the lack of facilities (no showers…) is not a big deal, you’re sleeping under the stars in Yosemite NP for cryin’ out loud! 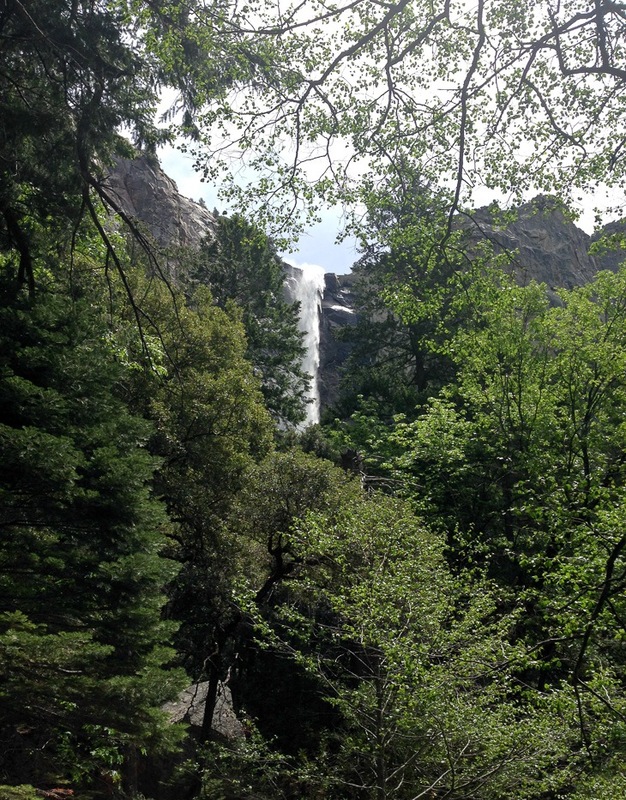 There are so many beautiful hikes, and you can’t say you’ve been to Yosemite if you skipped a hike to one of its gorgeous falls. 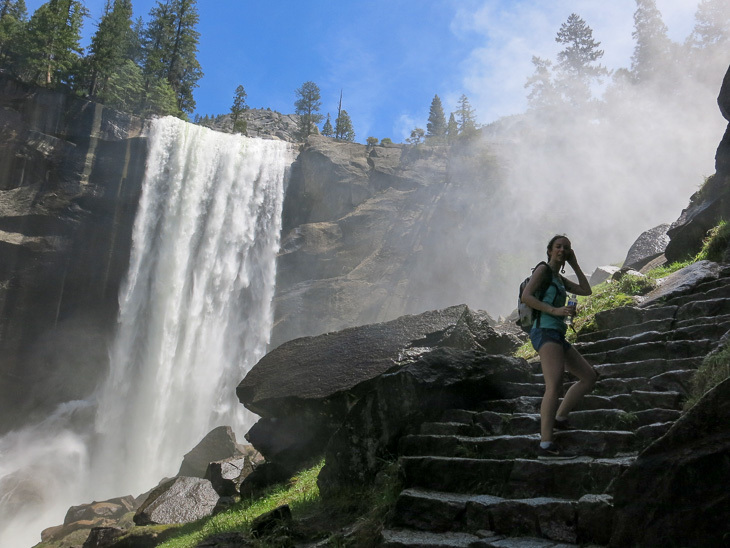 In the spring the falls are at their best, so we were “lucky” to be soaking wet after a hike on the famous Mist Trail. 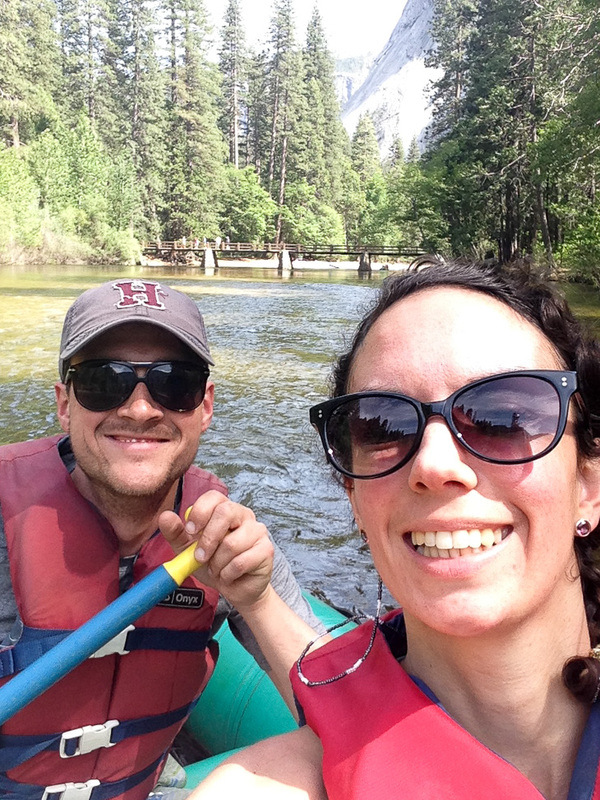 Rent a raft for the afternoon and take in the scenery as you gently go down the stream of the Merced River. 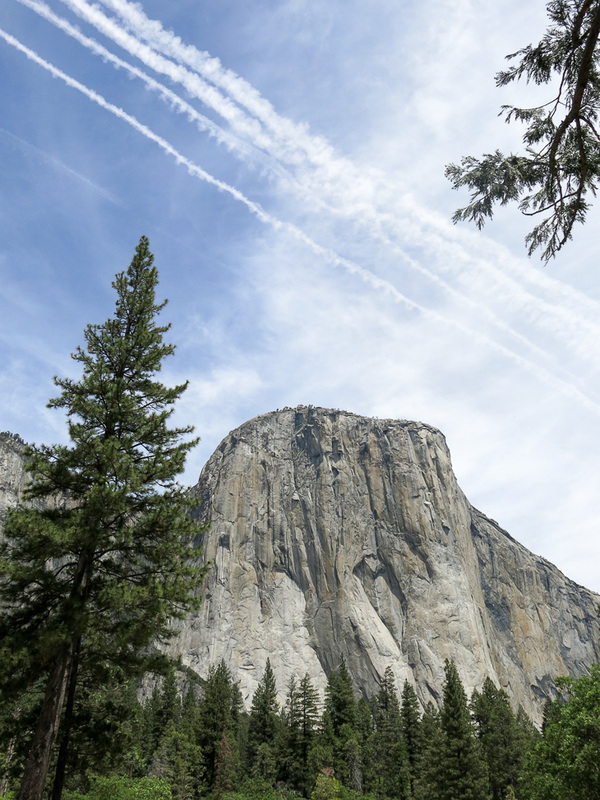 The views of El Capitan, Half Dome and the Yosemite falls are magnificent. 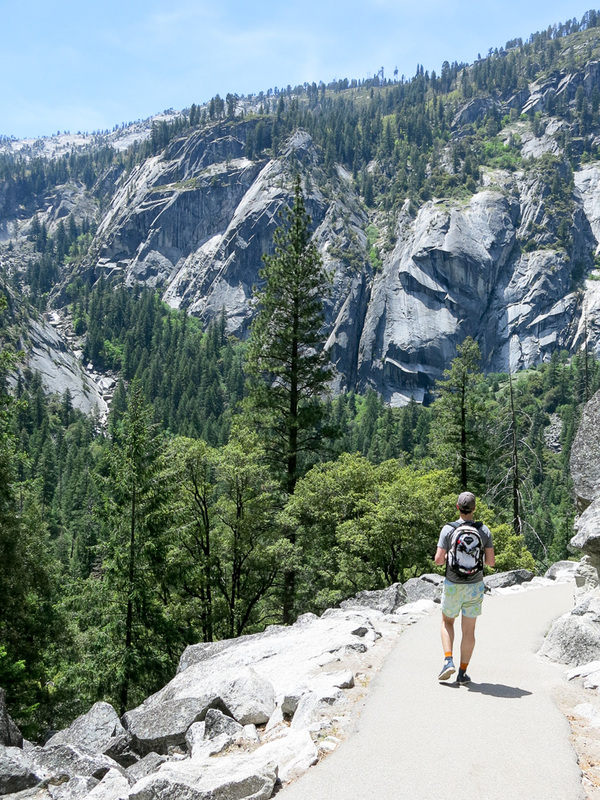 Even though Yosemite is outdoor heaven, there is a free (hybrid) shuttle service available within Yosemite Valley if you don’t feel like hiking all the time. The free shuttle also means that car-loving-Americans are more inclined to leave their car parked. Yay for the environment! 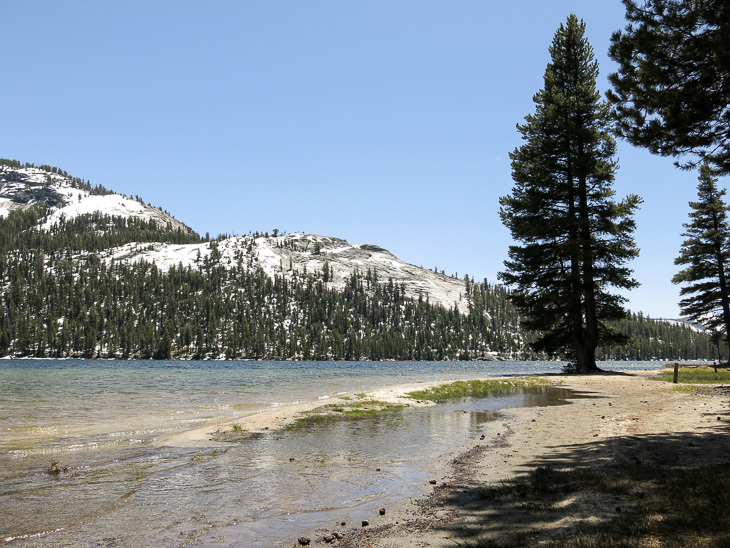 When Yosemite was first established in 1872 Mirror Lake was much larger than it is today (global warming anyone? 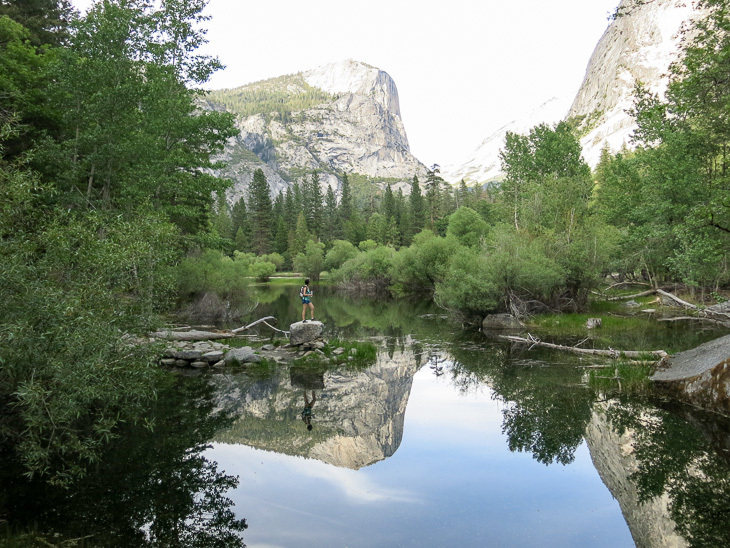 ), but it still is so beautiful to catch El Cap and Half Dome reflected in the lake. 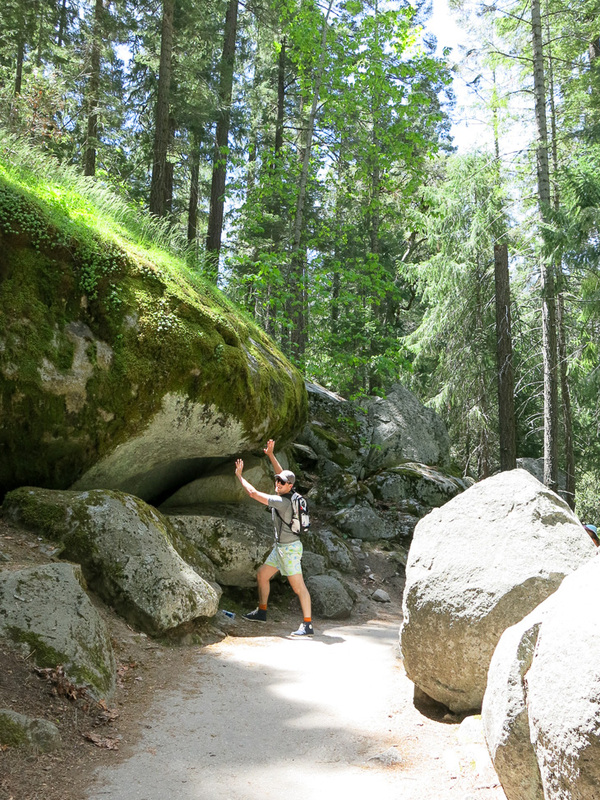 Tip: stand on the large rock on the Eastern side of the lake and let someone take your picture. 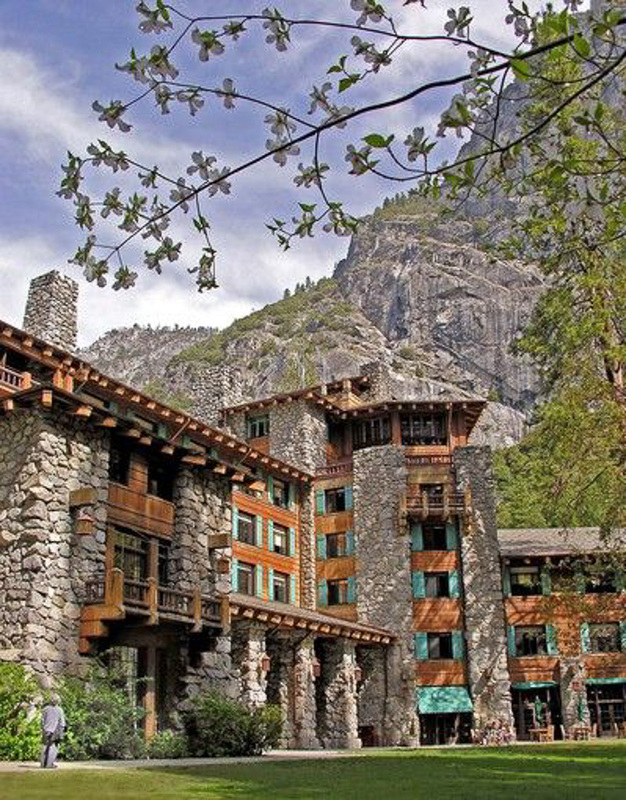 There are two high-end hotels within the park that both have amazing dining rooms: Yosemite Lodge provides dinner with a view of Yosemite Upper and Lower Falls, and the Ahwahnee Hotel is where presidents are known to reside while visiting the park. 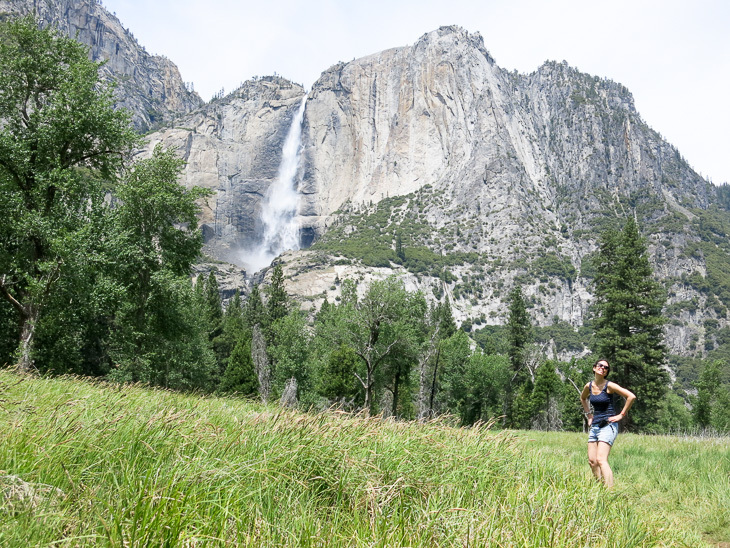 Treat your hiked-out body to a wonderful meal to replenish and get ready for the next hike. 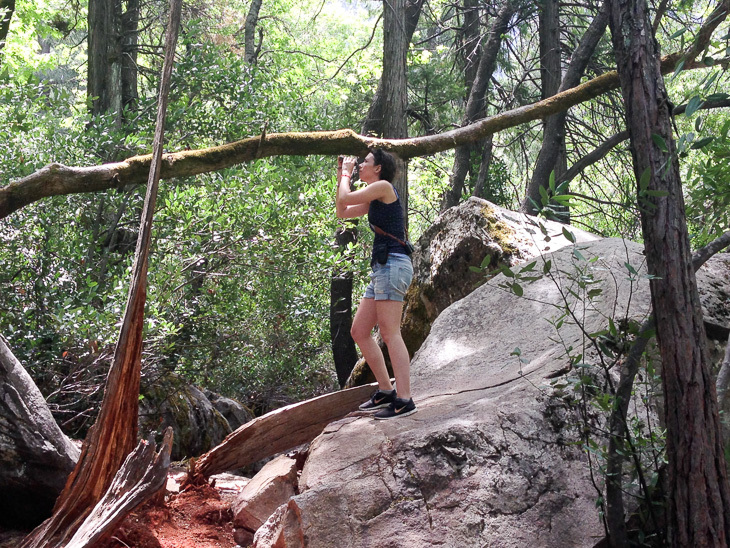 Dress code: resort casual – no hiking outfits! 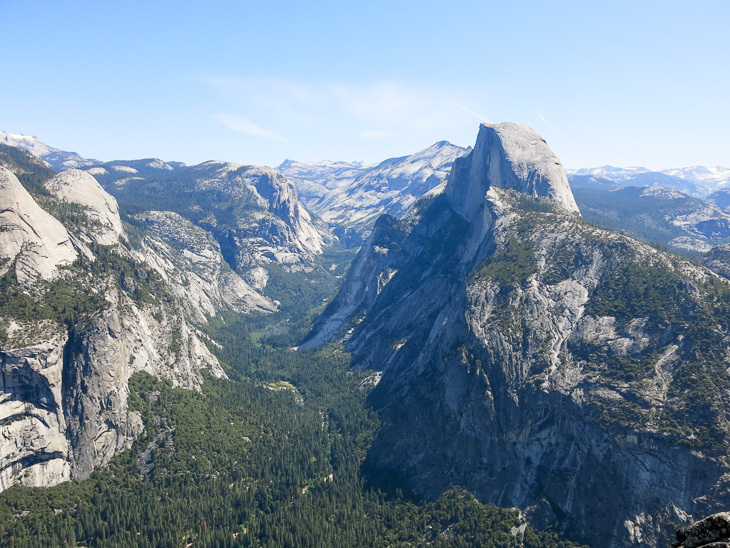 Due to heavy snowfall the road to Glacier Point is closed during the winter months, so if it’s open definitely go there. 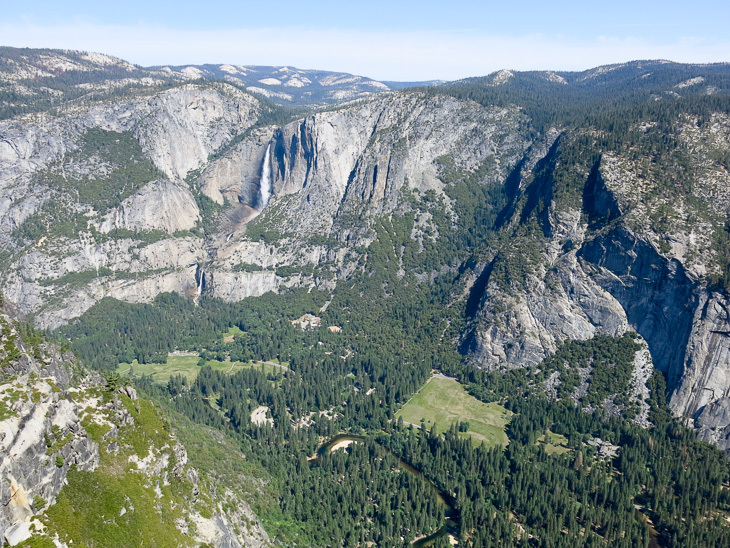 The views of Yosemite Valley are amazing since you stand on one of the highest points of the south wall. 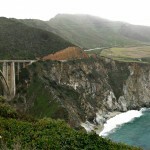 This is the only road that traverses the park. 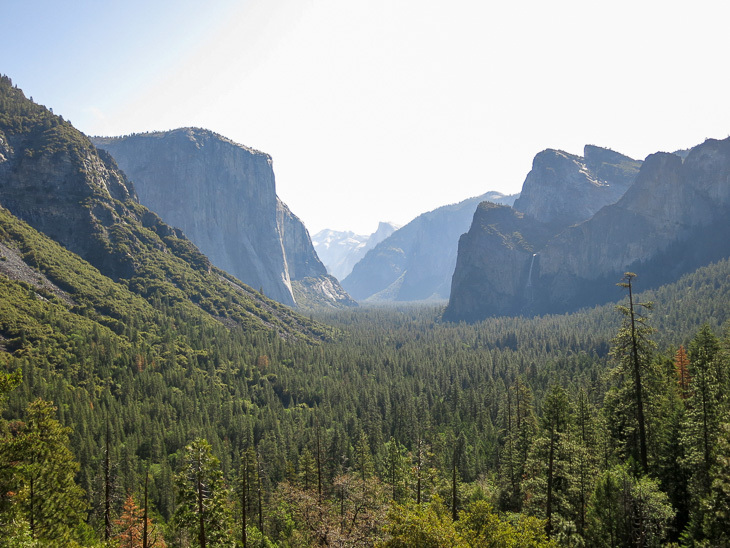 Most visitors enter and exit the park at the west entrances since these are closest to San Francisco and LA. But it’s really worth it to ignore the crowd and exit the park in the east. 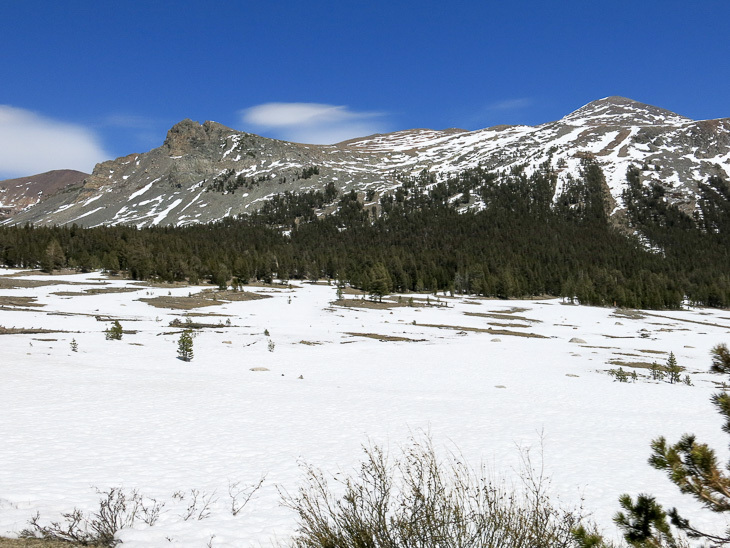 Tioga Pass is closed during the winter months due to heavy snowfall and usually opens somewhere in June, but we got lucky since the road just opened a few days before we got there. 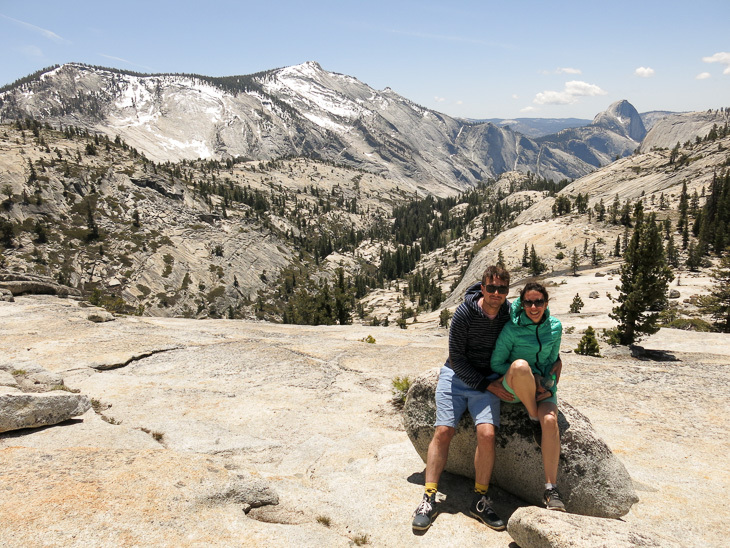 You will cross beautiful wild flower fields at Tuluomne Meadows, Tenaya glacier lake, and a great vista at Olmstead Point. 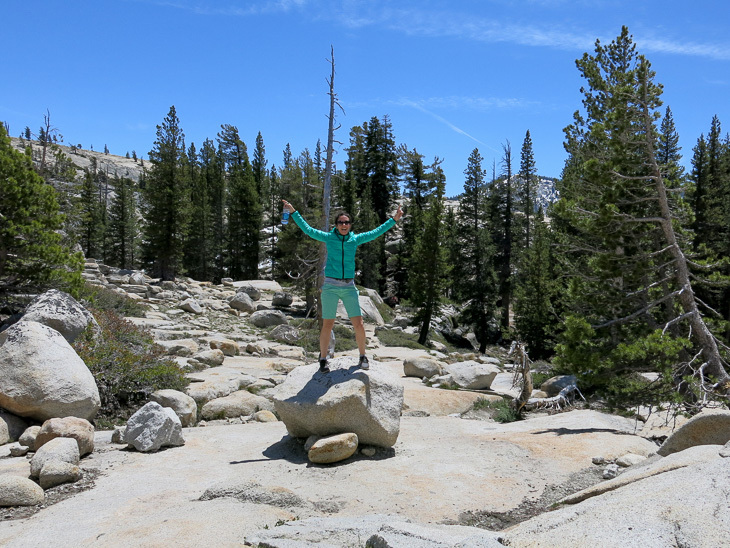 Don’t forget to bring a warm jacket since it can be pretty cold at almost 10,000 ft (3,000 m)! 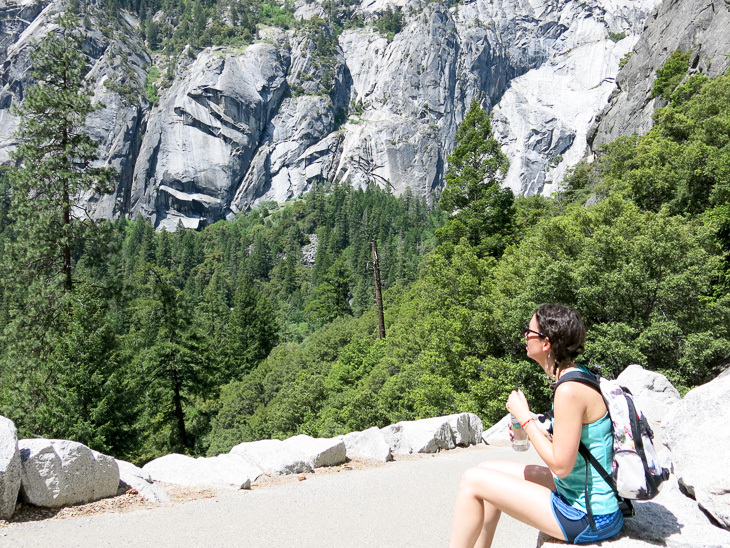 Even though I feel like we’ve explored quite a lot of Yosemite, we’ve probably not even seen 10% of the entire park. 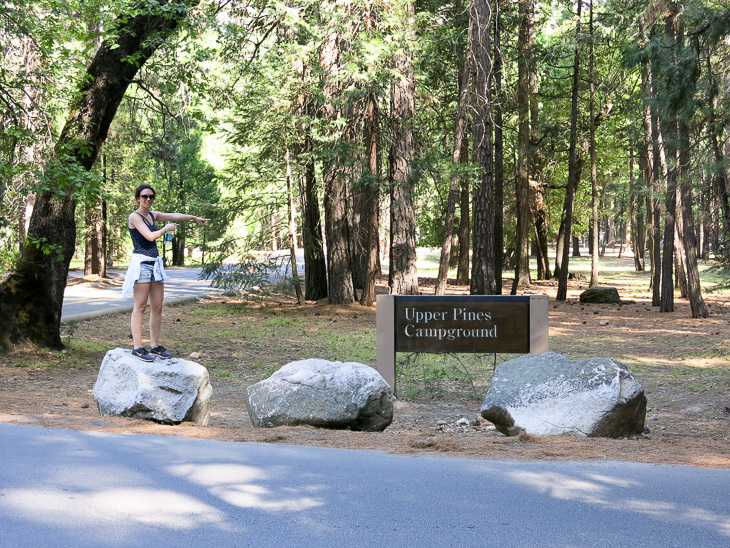 I’ll definitely want to come back for more: to check out the mega trees at Mariposa Grove of Giant Sequoias, to explore Hetch Hetchy, to hike more miles on the John Muir Trail, to bike around the Valley floor, to spot a bear from far, far away (but close enough to catch it on camera), and to have many more other cool experiences. 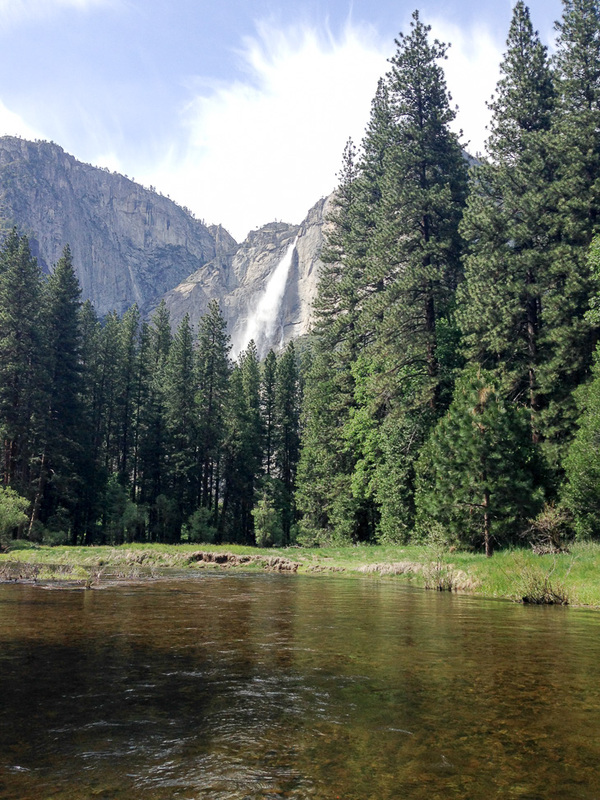 Yosemite: what a place. My oh my.